Remodeled by architect Frank Lloyd Wright. This house was built around 1873 for William H. Harman. Dr. Copeland commissioned Wright to add a garage behind this large late-Italianate house. 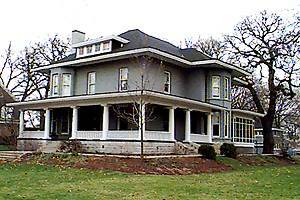 In 1909, Dr. Copeland retained Wright's services again to remodel the house itself. The alterations to the exterior included the construction of an entirely new tile roof above the level of the decorative brickwork. (Tile roofs are quite common in Oak Park, though can be very expensive to maintain; the tile roof on the Copeland House was removed in the 1950's.) Also, Wright added the porches, and replaced the original entrance with doors, frame, sidelights and transom of his own design.